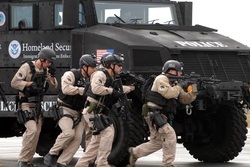 When the Department of Defense Surplus Program started issuing state, county and local law enforcement MRAP tactical vehicles through the 1033 Program (SASP), we saw a need for specialized and skilled training on the operations of these vehicles, not only for tactical purposes, but for safety concerns. With an average weight of 45,000 lbs and a cost of almost a million dollars per vehicle, damage to personnel and equipment is a major concern. Our proven track record of instruction can help minimize the possibility of risk and injury to your organization and the public. 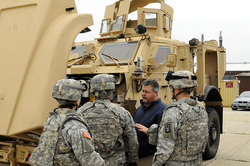 Smith Integrated Technologies has the most experienced and knowledgeable MRAP instructors available. Our team is made up of professional military instructors from MRAP University in Texarkana, TX where all service branches are sent to be trained and certified prior to deploying overseas in wartime scenarios. We specialize in all variants of MRAP vehicles. Our course includes vehicle familiarization, driving operations, location/function of controls and indicators, characteristics, emergency egress, warnings and cautions, operating under unusual conditions, operator level troubleshooting and OGPK/BPTMU (Objective Gunner Protection Kit/Battery Powered Motorized Traversing Unit) to name a few. We also offer full maintenance classes on all variants for those that are interested. Our professional instructors have a proven track record for safely implementing MRAP training all over the globe for Military and both Federal and Local Law Enforcement. Your organization will receive a thorough MRAP curriculum utilizing classroom time, hands on instruction detailing every aspect of the vehicle, and professional driving applications. We realize not all organizations require the same guidelines; therefore, we're able to tailor a training schedule to meet our clients individual needs. Smith Integrated Technologies combines MRAP technical and acquisition expertise with small business agility to maximize the optimal end result for our clients. Save your organization valuable time and resources by utilizing our mobile training team versus deploying your personnel. In addition, your team will obtain training on the exact vehicle your team will be utilizing for critical missions.